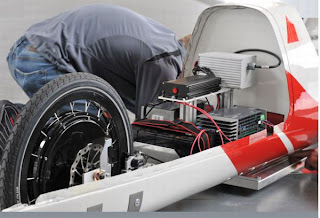 Fourteen students from the University of Karlsruhe, technology and industry have come up with an electric car that runs only with wireless power transmission. Christened as e-Quickie, the three wheeled car resembles a reclining bicycle with a driver capsule. The interesting thing about the vehicle is it doesn’t get start by the batteries but by leaving the energy conductors on the ground. The vehicle gets its energy from electric conducting paths on the ground. Receivers underneath the car take energy from the tracks through electric induction, directing it onward to the car’s electrical hub motor. All the individual components of the car including its steering, breaks and chassis are designed by the students. Apart from these, e-Quickie’s shell is made from the carbon fiber to ensure minimal weight and the optimal aerodynamic efficiency. The total weight of the car is 60kg, which, as per the project director, can be reduced to 40kg. 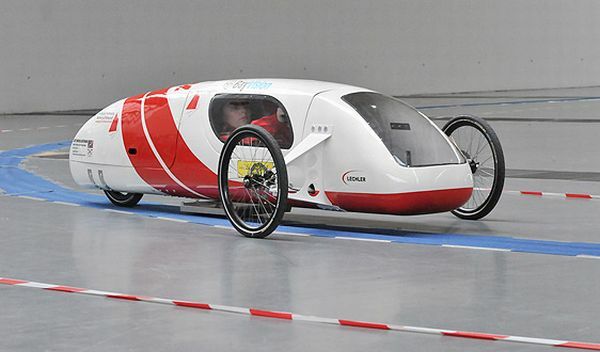 The car is powered by a 2kw bicycle hub motor and achieves a top speed of 50 km/h. The batteries only serve as a buffer so are much smaller than a typical EV traction battery. wow! this is totally outstanding!